Durga Puja, the most important festival of Bengal, had arrived again. The festival marked the victory of good over evil with Goddess Durga epitomising the good and emerging victorious after putting to death the evil demon 'Mahisasur'. Mythology also has it that during the five days constituting the festival, Goddess Durga, her four children in tow, takes leave from her husband, the great God Lord Shiva, and comes home to be with her parents. Idols of Goddess Durga, her sons Kartik and Ganesha, and her daughters Lakshmi and Saraswati, adorn the beautifully constructed pandals in parks and on the roadside and are worshipped by all and sundry with chanting of hymns and Sanskrit slokas. People deck up in new clothes, flock to the pandals and soak themselves in the festive spirit. Over the years, the level of craftsmanship in the making of the pandals and the idols has steadily risen. With more than a little help from the print and electronic media, the craze for visiting the pandals and seeing first hand the creation of the craftsmen and sculptors has also risen, so much so, that even my son, all of eight years, looks forward to embark on the pandal-hopping spree each year. This year was no different and we started our Puja Parikrama (tour of Puja Pandals) on 'Sashti', the first day of the festival itself. We went to visit the pandal at FD Park, Salt Lake, not far from our residence. 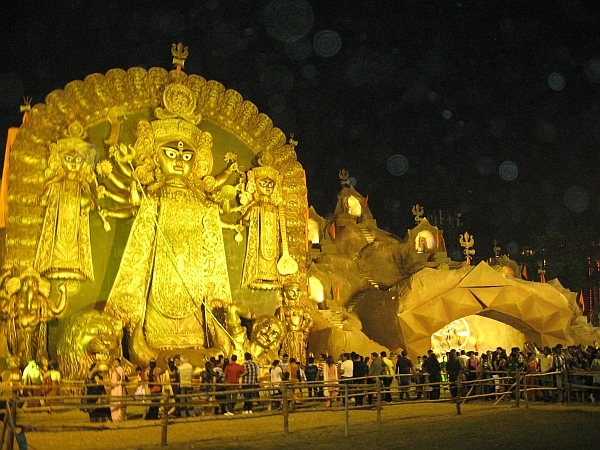 A huge and magnificent pratima (idol) of Goddess Durga, painted in gold, stood towering under the open night sky. Smaller pratimas of the Goddess in other avatars were housed in artificial caves on both sides of the main pratima. The crowd was swelling by the minute, yet it did not feel too crowded because of the huge open space the park provided (FD Park happens to be one of the biggest parks in Salt Lake). We visited quite a few other pandals in Salt Lake the same night but the one which stood out was the one in CK-CL Park near Korunamoyee. The entire pandal was made primarily of steel wires bent and wound to produce remarkable shapes and designs. The pratima of Goddess Durga also had a silvery hue and blended very well with the pandal structure. 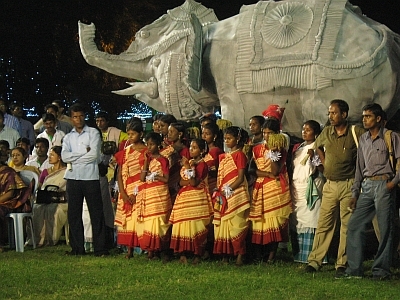 In the lawn besides the pandal, a group of young adivasi boys and girls were performing a traditional adivasi dance to the accompaniment of the beats of a drum. Adivasi girls awating their turn to dance in front of CK-CL Park Pandal in Salt Lake. The whole of next day, 'Saptami', was spent at our block's (BE West) Puja Pandal. In the afternoon, we participated in the community lunch, comprising deliciously cooked khichuri with papad and chutney. We had a few relatives drop by at our house in the evening and decided to have dinner at 'Mishras', a restaurant close to our home. We hadn't anticipated the rush though, and had to wait for one and a half hours before we could get a seat at a table. The food, comprising of biryani, mutton chaap and tanduri rotis, was however very tasteful and we had no reason to complain. 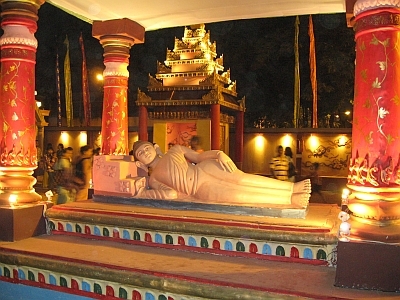 A statue of Buddha in a reclining posture inside the AD Block Pandal in Salt Lake. The following day 'Astami', started with us offering 'pushpanjali', a ritual of chanting Sanskrit slokas in front of the idol of Goddess Durga and offering her flowers at the end. The community lunch in the afternoon at our block's pandal comprised of luchis, aloor-dum and sweets. As the sun set in, we put on our new clothes and went out to visit the remaining pandals in Salt Lake. Amongst the most eye-catching ones were the pandals in blocks AD, AJ, BE East and CA. At AD Block, the pandal resembled a Buddhist temple from the far-east, with pagoda style structures, water-bodies and beautifully sculpted figures of Lord Buddha in various postures. The theme of the pandal at AJ Block was a castle in fairyland. Needless to mention, it appealed to my son the most. The pandal at BE East depicted a sun-dial, the likes of which were used long before the advent of clocks to measure time and date. CA Block's pandal was a quaint two storied house made of wood, the likes of which one sees at hill-stations. By the time we visited the last pandal, it was quite late in the night and all of us were tired and hungry. As for dinner, it was Biryani again, this time from a fast-food joint from our local market. Intriguing perspective of Ekdalia Evergreen Pandal at Gariahat. The next day was the penultimate day of the festival called 'Navami'. The community lunch organized by our block's puja organizers was a delicious vegetarian spread of rice, ghee, daal, subzee, chutney and papad. I was contemplating a nice afternoon nap to complement the wonderful lunch but that was not to be. My son was adamant that we visit the big pandals of Kolkata as we did the previous year. So there we were, decked up again in the sweltering heat, on our way to visit the pandals of South-Kolkata. We started with the one at Bosepukur, somewhere beside the road connecting Ruby Hospital with Gariahat. The entire pandal was constructed with a mind-boggling array of aluminium utensils like plates, cups, pans, glasses and even spoons. We proceeded on foot to watch the pandal at Talbagan which too had a similar theme, but with earthen pots replacing the aluminium utensils. A bus ride across the Bijon Setu brought us to Gariahat crossing and to the Ekdalia evergreen pandal. At first glance the pandal comprising of a flat faced vertical structure looked staid and unimpressive. 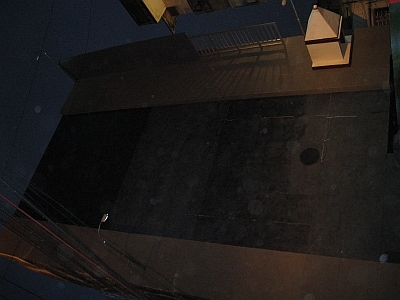 A closer look revealed that the flat face was that of a road which seemed to have risen abruptly in front of us at an angle of ninety degrees. Interestingly the lamp posts on the road sides were horizontal since the road was perpendicular. The perspective was indeed intriguing. A long walk with hundreds of other puja revellers and many a gulp of water and pepsi later (it was a sweltering evening! ), we reached the Singhi Park pandal on the other side of the Gariahat main road. The approach to the pandal was lit up with exquisite displays of lighting of different designs. There was also a skeleton-robot dancing to music and enthralling the little ones. The pandal itself was a replica of the Dakshineswar Temple. We proceeded on foot to watch the pandals at Deshapriyo Park and Hindustan Park and another one nearby called TriDhara. This was the one we liked the most. It resembled a palace in Rajasthan. The idol of Goddess Durga was made of marble and as the evening puja was in progress, fumes and the scent of 'dhuno' filled the air around, giving it a mystic touch. Our next stop was Maddox Square pandal near Landsdowne, a long walk through alleys and over footpaths besides the main roads. Both the pandal and the idol were exquisitely done in traditional style. What was most remarkable was the size of the crowd, both inside and outside the pandal. The lawns outside the pandal were chock-a-block with young college goers, squatting and enjoying 'adda' (gossip), with a carefree attitude only they can have. Our last stop was the Park Circus pandal, a good fifteen minutes taxi ride from Maddox Square. The pandal was huge, so was the idol of Goddess Durga. A big fair was also running on the grounds outside. As we got onto to an air-conditioned Volvo bus (a Puja special, so we were told by the conductor!) for our journey back home, we could feel a sense of hollowness as the festival had neared its end. 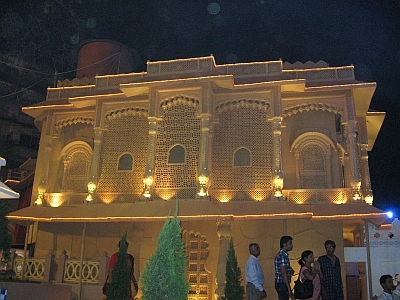 Rajasthani palace depicted in TriDhara Pandal close to Deshapriya Park. We woke up quite late the next day with a heavy heart. This was to be the last day of the festival, 'Bijoya Dasami'. Our feet felt heavy too, as they were yet to recover from the pounding received from the long walks the previous night. We spent the morning dusting and cleaning up the interiors of our house. Around noon, my wife went over to our block's puja pandal to participate in the ritual called 'Sindur Khela'. When she returned a few minutes later, I could barely recognize her, with vermilion smeared across her face, a handiwork of other married women of the locality as part of the ritual. In the afternoon, the idols of Goddess Durga and her children were put onto trucks parked in front of our block's pandal and after a slow procession through the lanes, they were taken to Babughat to be immersed in the holy waters of the Ganga. Before that, however, just like each year, the calls of "Ashchhe bochhor abaar hobe" rendered the air. It meant "We would have it again next year". Sure, we would! P.S. All the photographs above have been taken with my Canon Powershot A570 IS digital camera, making use of its various preset settings. I have optimised the images for the web using IrfanView. Let me know if you liked the page.